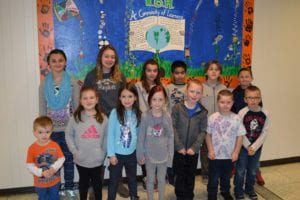 Congratulations to the Walter B. Howard Elementary students who have been named November Students of the Month! Students are selected by the homeroom teacher for showing overall good character that month. Front Row: Brady McKeon, Demi Kormos, Lily Robinson, Maria Burgess, Ian Middleton, Matthew Hagen and Bryce Schuster. Back Row: Callie Meizinger, Lyndsey Pratt, Anabell Gangale, Jacob Olin, Julian Smith and Connor Wills. Missing from picture: Julian Houghtling.